Yo-Yo Yan-Ma! Pokemon One a Day, Series 2! Today's illustration presented one of the first real times of this series of works where I really had trouble figuring out what I wanted to do. 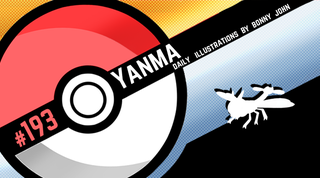 Between trying to figure out a style to present Yanma in relating to it's design, or at least find a style at all to make the work interesting, this one really had me spend hours doing a lot of guess and check. Yanma in itself is not very interesting of a design (I sound like a goddamn broken record at this point, but I speak my mind), as it's just a large dragonfly. There's no real theme to it and visually provides not much to work with. I began working on creating a sort of tribal styled Dragonfly tattoo that I've seen before. I looked up many takes on it and began molding my own. Visually, I kept trying different angles with fun colors, angular line work, and molding the two. Nothing was coming out to my liking. Eventually, I though of maybe illustrating Yanma in a sort of "Rorschach test" kinda way since I had been approaching the piece symmetrically. Although the style didn't fit the dragonfly in any particular way, it's not really a prequisite and it's better to explore creative options than not. In frustration, I began to layer all the time spent in to one piece, and found a mishmash of styles kinda building form. This immediately reminded me of the frantic and powerful buzzing of a dragonfly's wings, and their ability to hover and what not. That helped me direct energy to getting this visual down. The end result is colorful, features a lot of stray marks, paint splats, collage work (wing and dragon scales) tribal lines and enhanced eyes just to make it look more defined as a dragonfly even though Yanma's eyes are different. So that does it for today! Dumb Yanma, giving me a hard time! So I don't have to say it for the following two, we're gonna deal with some more weaklings and then get to the good stuff on Friday. Stay tuned and thanks for tuning in for today gang. Please leave any comments or critiques if you have any below. You aim to be the best Bug Catcher in all the land. Who is your trusty bug sidekick and how does he help you nab all them bugsz?